Aurum Naturals beeswax candles are made entirely of pure beeswax. No other wax or material is added. All of our beeswax is sourced from beekeepers in Michigan and Wisconsin, whose hives are surrounded by unfertilized and unsprayed wildflower fields. Pure beeswax produces a brighter, stronger flame that lasts five times longer than paraffin, without releasing any toxins into the air. Our beeswax is extracted from cappings which are produced by worker bees near the top of the hive, without disturbing the queen bee deeper in the hive. The high-quality capping wax imparts a golden-yellow color and a naturally sweet honey aroma. 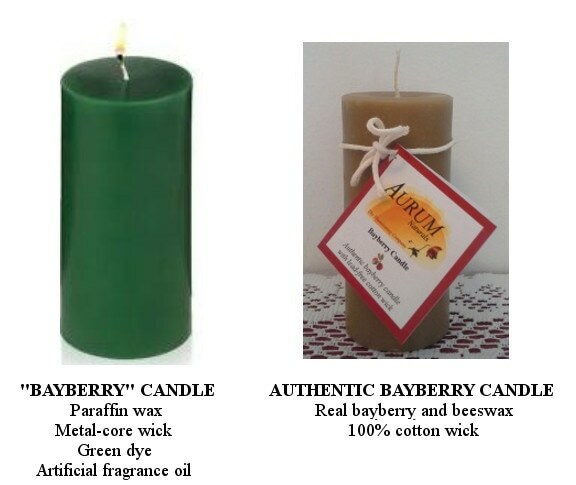 Real bayberry candles are difficult to find. You can find them here! Our bayberry candles are handmade from a blend of American-harvested bayberry and beeswax, which is required to prevent brittleness. Some customers report that the distinctive spicy aroma is milder than what they are accustomed to from fragrance oils, and that the color is an earthy green. For us, the subtle fragrance and color are proof of authenticity. Most commercial candles contain metal core wicks. Even the cotton wicks used by many home candlemakers are bleached and chemically treated. When burned, these wicks release harmful compounds into the air. We have searched the country to find a source of unbleached 100% cotton wicks, and remain one of the few candlemakers dedicated to using all-natural wicks. We prime the wick spools by dipping them in melted beeswax, allowing the wax to saturate through the cotton, and then pulling the spools taut to stiffen the wick as the wax hardens. Priming helps the wick stay upright during burning, without the need for a metal core or so-called burn enhancers. A properly primed wick stays upright, even in a pool of melted wax. 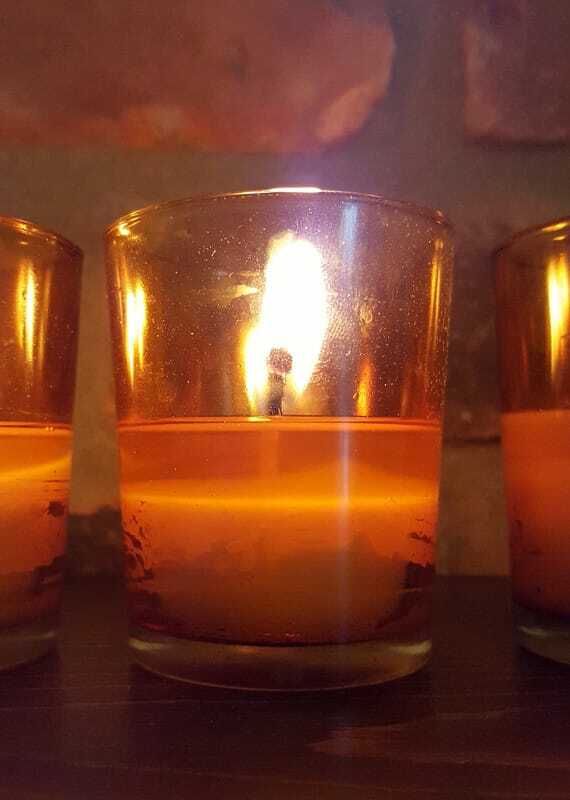 Off-centered wicks are the bane of candle-makers and candle users! To ensure a properly centered wick, each of our votives and columns are poured around a wick pin. These pins create a narrow hole through the center of the candle as the poured wax cools in the mold. When the candle is cool, we remove the wick pin and string the wick through the opening, which ensures that it remains exactly centered. We also add a wick tab to the bottom of each candle so that the candle can be burned safely to the base without wasting any wax. For wide pillars, which require extra-wide wicks, we use a wick-tightening bar to help carefully center each wick by hand. Attention to detail, and many hours of practice, have helped us perfect this skill! Beeswax melts at a higher temperature than other waxes and is best suited for a thick, square-braided wick. Like Goldilocks and her chairs, a candle wick can be too small, too large, or just right. An underwicked candle will have a small blue flame that may be extinguished by the wax pool. Significant unmelted wax will remain on the sides of the candle, creating "tunneling." And overwicked candle will have an excessively large flame that flickers erratically. A "mushroom cap" may form on the top of the wick, and arbon balls may fall into the deep wax pool as the candle burns too quickly. A properly wicked candle will be "just right," with a steady, even flame and warm glow. This scenario results in the optimum burn time and helps produce an appropriate throw of aroma into the room. We perform dozens of burn tests to ensure we are using the appropriate wick for each candle that we offer. 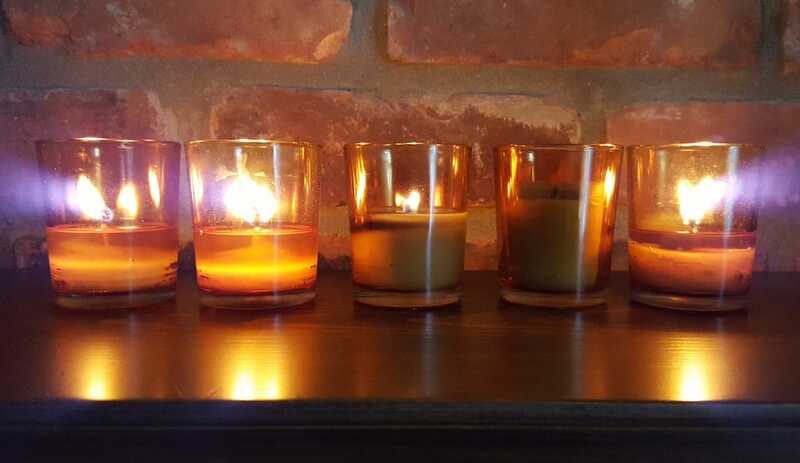 A "burn test" showing overwicked, underwicked, and "just right" candles. Our 100% pure beeswax and bayberry candles contain no added fragrance. These natural waxes offer a soft, gentle warmth into the room. For those who prefer a stronger fragrance experience, we offer a beeswax + aromatherapy line of votive candles. The scent in our aromatherapy candles comes from 100% pure essential oils-- never fragrance oils or so-called natural fragrances. Essential oils are volatile essences extracted from plants that impart the pure, true fragrance of the plant. Depending on the plant, 100-4,000 pounds of plant material are required to extract one pound of essential oil! All of the essential oils used in Aurum Naturals candles are steam-distilled to protect the the integrity of the compounds found in each oil. Our essential oils are sourced from North American suppliers wherever possible.